I won’t lie; this is a tough week for me. Without going into the details, it is the most anxiety-provoking week of the year. So, in an attempt to ward off the panic attack simmering just under the surface, I’m going to focus on the good that is to come in my world of knitting. First, I am super excited about the sweater design which was accepted for publication later in the year. Right now, the professional test knitter is working on the sample for the photography session. She is great – very interactive and posting weekly updates. I’m so excited to see the final product when she’s done. I have good feelings about this sweater design! Second, I’m working on a Fair Isle scarf pattern which I’ve had in my head for a while now. I bought the wool for it months ago but I’m only just getting to it now. My stranded knitting motif designs tend to fare well, even the cute kitschy ones (especially the cute kitschy ones) so I decided to go all out on this design. And you know what? It’s super cute. I kind of love it. 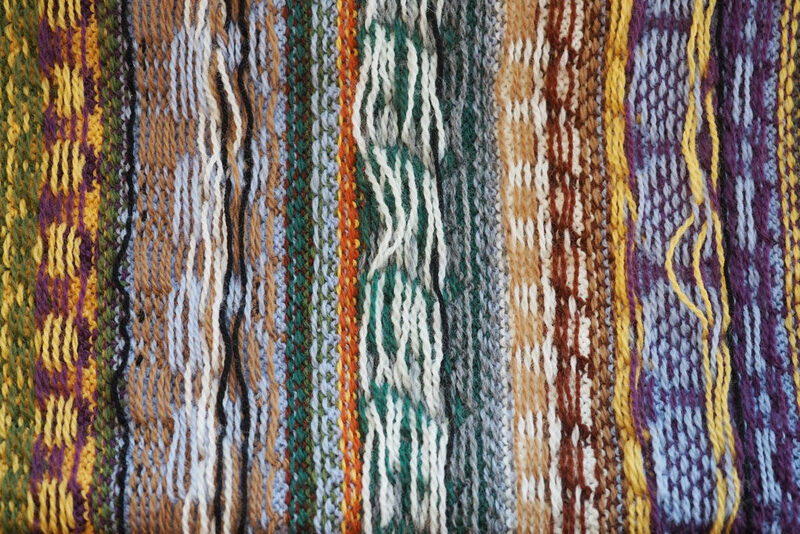 In fact, I love it so much that it has spawned a whole BUNCH of knitting design ideas – enough for an entire collection, I think! I’m so excited to be done with the scarf so I can start working on the next idea! The collection is going to be geared toward adults and kids, with sweaters and smaller accessories all based on a common theme. I really hope people will like it as much as I like it. I can’t show the design yet, so I’m showing you the back of the scarf! Third, I am SUPER excited to have been invited by my friend Tom to my first ever Webs Tent Sale! I know, I know, how can I call myself a knitter if I’ve never been to a Webs Tent Sale?? Well, we’re about to rectify this situation in approximately a month. I’m already making a list of necessities and leaving room for fun shopping. I cannot wait! Fourth, I am getting ready to submit another design for publication. I’ve been holding on to the design for a while now, looking for the right collection, and I think I’ve found it. I hope it will be accepted. It’s really a unique and lovely design. Of course, I REALLY don’t know why I’m getting myself into yet ANOTHER design situation right now, but this is what I do. It will get done, by needle or by hook! Fifth – and this is super wonderful – I am the proud owner of three tickets to Edinburgh, Scotland for later this summer! We are making a trip abroad to visit my brother in northwest UK, and I am so excited! We are going to have a great trip, and even if we don’t have a gigantic itinerary, we are looking forward to communing with the sheep and enjoying the salt air and traipsing through a few castles and stone circles. And most of all, seeing my brother! You are going to have so much fun at Webs. I went to their sidewalk sale for the first time last year. It was great! I am going again this year (Saturday). Maybe I will see you there? Either way enjoy. Glad to hear you are going to see your brother. That will be fun too, but in a different way then Webs.